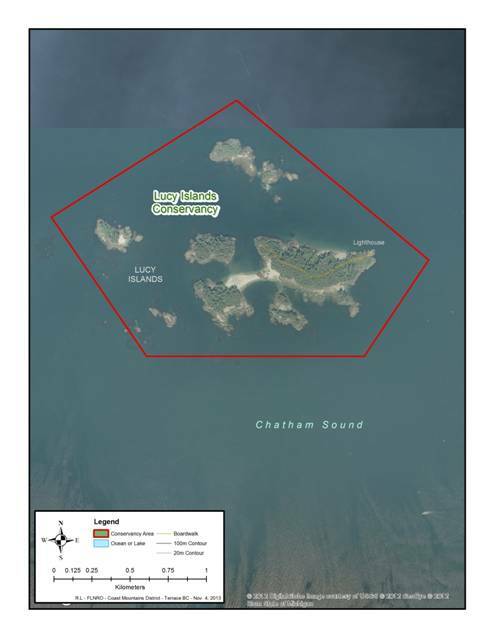 Lucy Islands Conservancy is on the northwest coast of British Columbia, within the traditional territory of the Coast Tsimshian which includes both the Metlakatla and Lax Kw’alaams First Nations. Lucy Islands has been used since time immemorial by the Coast Tsimshian for cultural, social, ceremonial, and economic purposes. Lucy Islands hosts a unique combination of cultural and natural values in a small area. The very wet coastal hemlock forest on the archipelago is a significant breeding area for a variety of seabirds. 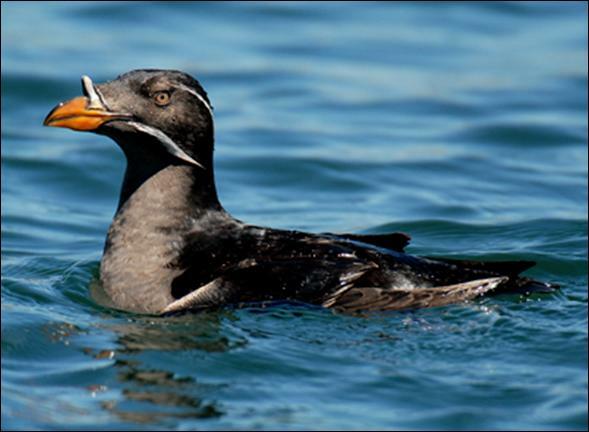 The rhinoceros auklet is the most abundant seabird on Lucy Islands and builds underground burrows to nest. These nests are very sensitive to disturbance, which is why it’s very important to stay on the boardwalk. To fully enjoy Lucy Islands, visitors must respect and understand these values and the rules to protect them. Discover more about Lucy Islands on the interpretive signs found along the trail. Lucy Islands is significant in the protected area system. important local recreational opportunities associated, including those related to the interpretation of the rhinoceros auklets, the area’s cultural values and associated navigational light. a helicopter pad not far from the boathouse on the western tip of the main island. A 600-metre long boardwalk, which extended from one end of the island to the other, linked the helicopter pad and the residential buildings. In 1988, the lighthouse was automated and the house was removed. The boardwalk was left for visitors; to provide for safe and ongoing recreation opportunities, the boardwalk was completely replaced in 2010 and 2011. Stay on the boardwalk and trail at all times to protect the seabirds and nesting burrows from disturbance. Numerous archaeological sites exist on Lucy Islands. It is an offence to disturb or remove material from these sites. Learn about the archaeological sites from the signs along the boardwalk. No fresh water is available on Lucy Islands, so users need to bring their own. There is one outhouse and a tent pad in the conservancy. Please utilise the facilities to avoid impacts to the auklet nesting burrows. No domestic pets are allowed on Lucy Islands to protect the seabirds from disturbance. No fires allowed after dark between March and September because the nocturnal birds are disoriented by light. Keep fires below tide line and collect wood from the beach. No motorized vehicles on the Islands. Consult the fishing regulations if you plan to fish. Keep Lucy Islands clean! Pick up garbage and pack all litter out. Conservancy Size: 206 hectares – 28 hectares of upland habitat in the Hecate Lowlands Ecosection and 178 hectares of foreshore in the North Coast Fjords Marine Ecosection. 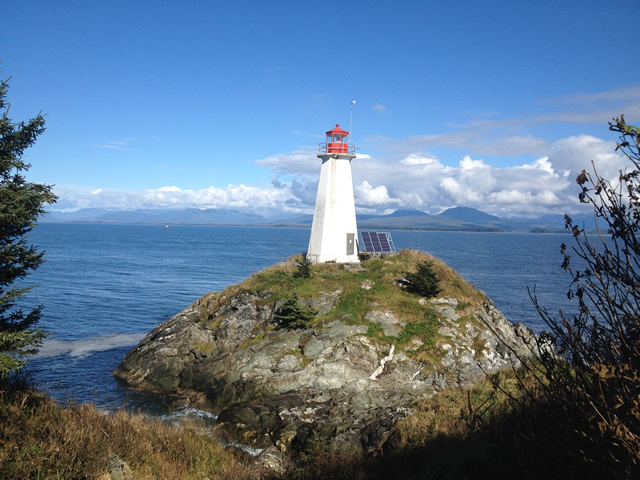 It covers a number of small islands and rocky islets located in Chatham Sound, including Lucy Islands, and the waters surrounding them for a distance of 200 metres seaward from the high water mark. The conservancy is approximately 13 kilometres west of Metlakatla, 30 kilometres southwest of Lax Kw’alaams (Port Simpson) and 20 kilometres west of Prince Rupert. Nearby protected areas include: Lax Kwaxl/Dundas and Melville Islands Conservancy 8 kilometres to the north, Khutzeymateen Inlet Conservancy 53 kilometres to the northeast, Kennedy Island Conservancy 40 kilometres to the southeast and K’sgaxl/Stephens Island Conservancy 13 kilometres to the southwest. History: Lucy Islands Conservancy was designated as a conservancy on June 27, 2008 following recommendations from the North Coast Land and Resource Management Plan. The conservancy provides good opportunities for beach combing, fishing and wildlife viewing. Cultural Heritage: The conservancy is in the asserted traditional territories of the Coast Tsimshian which includes both the Metlakatla and Lax Kw’alaams First Nations. Specifically, the area is within the traditional territory of the Gitwilgyoots. The Gitwilgyoots (people of the kelp) are one of nine tribes that make up the Coast Tsimshian First Nations. They are also members of the hereditary organization known as the Allied Tsimshian Tribes. 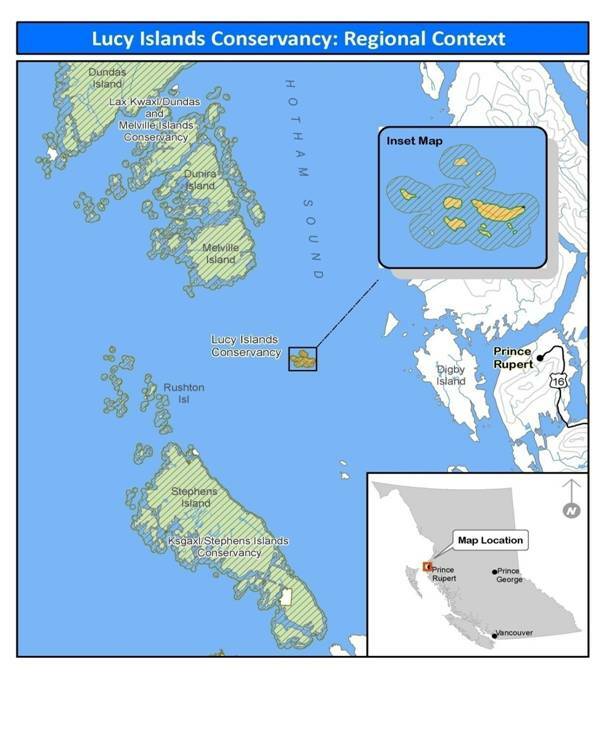 Collaborative Management Agreements: Protected area collaborative management agreements have been reached between the Ministry of Environment and both the Lax Kw’alaams First Nation and Metlakatla First Nation . These agreements establish a framework for the governments of the Coast Tsimshian and the Province of British Columbia to collaborate on the planning and management of protected areas. Wildlife: Lucy Islands support a globally significant population of rhinoceros auklets, with approximately 26,000 nesting pairs recorded, representing about 5% of the global population. The auklets primarily nest on the perimeter of the vegetated islands, up to 120 metres inland. Nationally significant concentrations of pigeon guillemots also breed on the island. Other species nesting on the islands include glaucous-winged gulls, black oystercatcher and bald eagle. Humpback whales, killer whales, Dall’s porpoises, Pacific white-sided dolphins, sea lions and harbour seals can also be seen in the adjacent marine waters. Most recreational use is by kayakers and small vessels from adjacent communities. Kayakers use the conservancy as a strategic location when crossing from Prince Rupert to the Melville-Dundas Islands. The islands offer a protected lagoon with sandy beaches, as well as hiking and wildlife viewing. The shallow waters in the area have many fascinating reefs. The shallows south of the islands offer excellent fishing, making the Lucy Islands a popular destination for Prince Rupert residents. Adventurous and experienced canoeists or kayakers may enjoy exploring the inlets, bays, lagoons, and shorelines in this conservancy. The many inlets can be sheltered and calm, with landing beaches available. Wilderness and backcountry camping is allowed on the provided tent platforms to protect the auklet nesting habitat. Kayak rentals are available in Prince Rupert. Please check the BC Hunting & Trapping Regulations Synopsis for more information. Swimming is possible in the ocean, but the water is cold all year-round and subject to strong tides. There are no lifeguards on duty at provincial parks. Humpback whales, killer whales, Dall’s porpoises, Pacific white-sided dolphins, sea lions and harbour seals can be seen in the adjacent marine waters. Wilderness, backcountry camping is allowed, but please tread lightly and utilise existing tent pads.